ThorntonWeather.com's picks for the best drives to view the fall foliage. 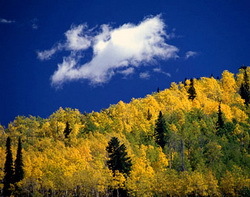 This time of year many folks head to the hills west of Denver in search of gold – fall foliage gold. This year thanks to the warm and dry weather, the season is running longer and a bit later than normal so this coming weekend looks to be a great one to get out and go for a drive in the mountains. Where to go? Below are five of ThorntonWeather.com’s favorite ones near Denver. After that, we will tell you where you can find a great website that provides regular updates on viewing conditions. I-70 Corridor – If you’re looking for the easiest route, then this one is for you. Simply head west on I-70 about 110 miles to Avon. Between Vail and Avon, both sides of I-70 are lined beautifully with aspen. Rocky Mountain National Park – One of the most popular summer destinations in the state is of course also a prime spot to view aspen in all their glory. Once in the park on Trail Ridge Road, head toward Bear Lake. Glacier Gorge Junction provides a beautiful spot and you of course also get to enjoy all the splendor that Rocky Mountain National Park has to offer. Peak to Peak Highway – This little road trip can be a dual purpose trip – gambling and fall foliage viewing! Take U.S. 6 through Clear Creek Canyon and then 119 through Blackhawk and Central Center. You can of course stop there if your wallet is fat enough and donate some money to the casinos. From there continue on 119 toward Nederland. Take highway 72 toward Ward and Allenspark. There you will find more golden aspen than you can imagine, all with the Continental Divide nearby. Poudre Valley Canyon – Heading north on I-25 take Colorado 14 west and into Poudre Canyon and Roosevelt National Forest. As you continue west you will come very near timberline as you come to Cameron Pass. Amazing views abound! Guanella Pass – This is a nice, relatively short drive from Denver. From C470 take 85 through Bailey and Conifer, a nice drive unto itself. When you come to the town of Grant, take the Guanella Pass Scenic and Historic Byway north to Georgetown. The air is pretty thin along the way as you climb in excess of 11,500 views through the Pike and Arapahoe National Forests. Fair warning – about 10 miles of the road is gravel but it is well maintained. So do you think you will try one of these drives? Or maybe one of the other dozens (hundreds?) that are possible? Before you go, be sure to check out the U.S. Forest Service’s Fall Colors website! It provides weekly updates on viewing conditions throughout the Rocky Mountain region and is a great resource to plan your trip. The site is usually updated once a week on Fridays. Click here to view the Rocky Mountain Region 2008 Fall Color Report. This entry was posted on Friday, October 3rd, 2008 at 5:31am MDT and is filed under Colorado Weather, Local News, Thornton Weather. You can follow any responses to this entry through the RSS 2.0 feed. You can skip to the end and leave a response. Pinging is currently not allowed. Very good timing. We went up to Guanella Pass yesterday based on your advice and it was absolutely beautiful.